Fr. Patrick Winslow graduated from State University of New York at Cortland in 1991 with a B.S. in Chemistry . From 1992-1993 he attended Georgia Institute of Technology, Graduate Department of Chemistry. While at Georgia Tech, he began a doctoral program in analytical chemistry but left to attend the seminary. During his six years in Seminary, he spent three months at Medellin Institute of Languages, in Medellin, Columbia studying Spanish. 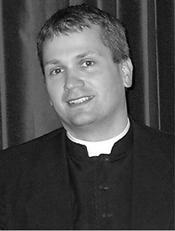 In 1999 he earned his STB in Theology from Catholic University of America and was ordained a priest in June of 1999. In 2002, Father was assigned to St. Vincent de Paul parish in Charlotte, NC as Parochial Vicar. He currently is serving as Pastor at St. John the Baptist Church in Tryon, NC. Fr. Winslow gained great popularity among Bible study students around the world through his DVD lectures with the Catholic Scripture Study program and his popularity again grew in the Upstate of South Carolina with his radio talk show on Catholic Radio. Currently, Father Winslow is studying toward a JCL in Cannon Law at Catholic University of America.